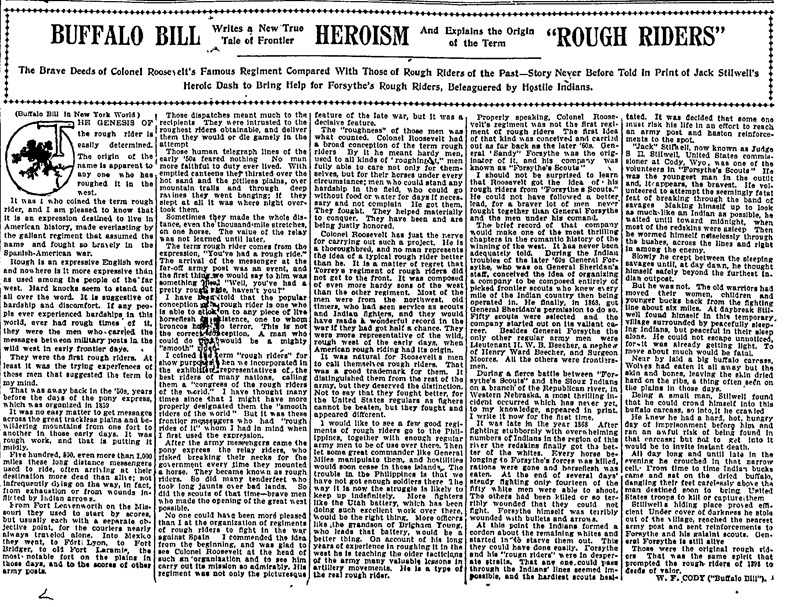 Title: Buffalo Bill Writes a New True Tale of Frontier Heroism and Explains the Origin of the Term "Rough Riders"
The Brave Deeds of Colonel Roosevelt's Famous Regiment Compared With Those of Rough Riders of the Past—Story Never Before Told in Print of Jack Stilwell's Heroic Dash to Bring Help for Forsythe's Rough Riders, Beleaguered by Hostile Indians. THE GENESIS OF the rough rider is easily determined. The origin of the name is apparent to any one who has roughed it in the west. 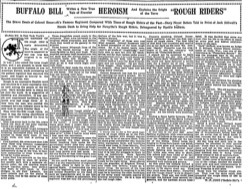 It was I who coined the term rough rider, and I am pleased to know that it is an expression destined to live in American history, made everlasting by the gallant regiment that assumed the name and fought so bravely in the Spanish-American war. Rough is an expressive English word and nowhere is it more expressive than as used among the people of the far west. Hard knocks seem to stand out all over the word. It is suggestive of hardship and discomfort. If any people ever experienced hardships in this world, ever had rough times of it, they were the men who carried the messages between military posts in the wild west in early frontier days. They were the first rough riders. At least it was the trying experiences of these men that suggested the term to my mind. That was away back in the '50s, years before the days of the pony express, which was organized in 1859. It was no easy matter to get messages across the great trackless plains and bewildering mountains from one fort to another in those early days. It was rough work, and that is putting it mildly. Five hundred, 800, even more than 1,000 miles these long distance messengers used to ride, often arriving at their destination more dead than alive; not infrequently dying on the way, in fact, from exhaustion or from wounds inflicted by Indian arrows. From Fort Leavenworth on the Missouri they used to start by scores, but usually each with a separate objective point, for the couriers nearly always traveled along. Into Mexico they went, to Fort Lyon, to Fort Bridger, to old Fort Laramie, the most notable fort on the plains in those days, and to the scores of other army posts. Those dispatches meant much to the recipients. They were intrusted to the roughest riders obtainable, and deliver them they would or die gamely in the attempt. Those human telegraph lines of the early '50s feared nothing. No man more faithful to duty ever lived. With emptied canteens they thirsted over the hot sand and the pitiless plains, over mountain trails and through deep ravines they went banging; if they slept at all it was where night overtook them. Sometimes they made the whole distance, even the thousand-mile stretches, on one horse. The value of the relay was not learned until later. The term rough rider comes from the expression, "You've had a rough ride." The arrival of the messenger at the far-off army post was an event, and the first thing we would say to him was something like "Well, you've had a pretty rough ride, haven't you?" I have been told that the popular conception of the rough rider is one who is able to stick on to any piece of live horseflesh in existence, one to whom broncos have no terror. This is not the correct conception. A man who could do that would be a mighty "smooth" rider. I coined the term "rough riders" for show purposes when we incorporated in the exhibition representatives of the best riders of many nations, calling them a "congress of the rough riders of the world." I have thought many times since that I might have more properly designated them the "smooth riders of the world." But it was these frontier messengers who had "rough rides of it" whom I had in mind when I first used the expression. After the army messengers came the pony express, the relay riders, who risked breaking their necks for the government every time they mounted a horse. They became known as rough riders. So did many tenderfeet who took long jaunts over bad lands. So did the scouts of that time—brave men who made the opening of the great west possible. No one could have been more pleased than I at the organization of regiments of rough riders to fight in the war against Spain. I commended the idea from the beginning, and was glad to see Colonel Roosevelt at the head of such an organization and to see him carry out its mission so admirably. His regiment was not only the picturesque feature of the late war, but it was a decisive feature. The "roughness" of those men was what counted. Colonel Roosevelt had a broad conception of the term rough riders. By it he meant hardy men, used to all kinds of "roughing it," men fully able to care not only for themselves, but for their horses under every circumstance; men who could stand any hardship in the field, who could go without food or water for days if necessary and not complain. He got them. They fought. They helped materially to conquer. They have been and are being justly honored. Colonel Roosevelt has just the nerve for carrying out such a project. He is a thoroughbred, and no man represents the idea of a typical rough rider better than he. It is a matter of regret that Torrey's regiment of rough riders did not get to the front. It was composed of even more hardy sons of the west than the other regiment. Most of the men were from the northwest, old timers, who had seen service as scouts and Indian fighters, and they would have made a wonderful record in the war if they had got half a chance. They were more representative of the wild, rough west of the early days, when American rough riding had its origin. It was natural for Roosevelt's men to call themselves rough riders. That was a good trademark for them. It distinguished them from the rest of the army, but they deserved the distinction. Not to say that they fought better, for the United States regulars as fighers cannot be beaten, but they fought and appeared different. I would like to see a few good regiments of rough riders go to the Philippines, together with enough regular army men to be of use over there. Then let some great commander like General Miles manipulate them, and hostilities would soon cease in those islands. The trouble in the Philippines is that we have not got enough soldiers there. The way it is now the struggle is likely to keep up indefinitely. More fighters like the Utah battery, which has been doing such excellent work over there, would be the right thing. More officers like the grandson of Brigham Young, who leads that battery, would be a better thing. On account of his long years of experience in roughing it in the west he is teaching the older tacticians of the army many valuable lessons in artillery movements. He is a type of the real rough rider. Properly speaking, Colonel Roosevelt's regiment was not the first regiment of rough riders. The first idea of that kind was conceived and carried out as far back as the later '60s. General "Sandy" Forsythe  was the originator of it, and his company was known as "Forsythe's Scouts." I should not be surprised to learn that Roosevelt got the idea of his rough riders from "Forsythe's Scouts." He could not have followed a better lead, for a braver lot of men never fought together than General Forsythe and the men under his command. The brief record of that company would make one of the most thrilling chapters in the romantic history of the winning of the west. It has never been adequately told. During the Indian troubles of the later '60s General Forsythe, who was on General Sheridan's staff, conceived the idea of organizing a company to be composed entirely of picked frontier scouts who knew every mile of the Indian country then being operated in. He finally, in 1868, got General Sheridan's permission to do so. Fifty scouts were selected and the company started out on its valiant career. Besides General Forsythe the only other regular army men were Lieutenant H. W. B. Beecher, a nephew of Henry Ward Beecher, and Surgeon Moores. All the others were frontiersmen. During a fierce battle between "Forsythe's Scouts" and the Sioux Indians on a branch of the Republican river, in Western Nebraska, a most thrilling incident occurred which has never yet, to my knowledge, appeared in print. I write it now for the first time. It was late in the year 1868. After fighting stubbornly with overwhelming numbers of Indians in the region of this river the redskins finally got the better of the whites. Every horse belonging to Forsythe's forces was killed, rations were gone and horseflesh was eaten. At the end of several days' steady fighting only fourteen of the fifty white men were able to shoot. The others had been killed or so terribly wounded that they could not fight. Forsythe himself was terribly wounded with bullets and arrows. At this point the Indians formed a cordon about the remaining whites and started in to starve them out. This they could have done easily. Forsythe and his "rough riders" were in desperate straits. That any one could pass through the Indians' lines seemed impossible, and the hardiest scouts hesitated. It was decided that some one must risk his life in an effort to reach an army post and hasten reinforcements to the spot. "Jack" Stilwell, now known as Judge S. E. Stilwell,  United States commissioner at Cody, Wyo., was one of the volunteers in "Forsythe's Scouts." He was the youngest man in the outfit and it appears, the bravest. He volunteered to attempt the seemingly fatal feat of breaking through the band of savages. Making himself up to look as much like an Indian as possible, he waited until toward midnight, when most of the redskins were asleep. Then he wormed himself noiselessly through the bushes, across the lines and right in among the enemy. Slowly he crept between the sleeping savages until, at day dawn, he thought himself safely beyond the furthest Indian outpost. But he was not. The old warriors had moved their women, children and younger bucks back from the fighting line about six miles. At daybreak Stilwell found himself in this temporary village surrounded by peacefully sleeping Indians, but peaceful in their sleep alone. He could not escape unnoticed, for it was already getting light. To move about much would be fatal. Near by laid a big buffalo carcass. Wolves had eaten it all away but the skin and bones, leaving the skin dried hard on the ribs, a thing often seen on the plains in those days. Being a small man, Stilwell found that he could crowd himself into this buffalo carcass, so into it he crawled. He knew he had a hard, hot, hungry day of imprisonment before him and ran an awful risk of being found in that carcass; but not to get into it would be to invite instant death. All day long and until late in the evening he crouched in that narrow cell. From time to time Indian bucks came and sat on the dried buffalo, dangling their feet carelessly above the man destined soon to bring United States troops to kill or capture them. Stillwell's hiding place proved efficient. Under cover of darkness he stole out of the village, reached the nearest army post and sent reinforcements to Forsythe and his galaint scouts. General Forsythe is still alive. Those were the original rough riders. That was the same spirit that prompted the rough riders of 1898 to deeds of valor. W. F. CODY ("Buffalo Bill").